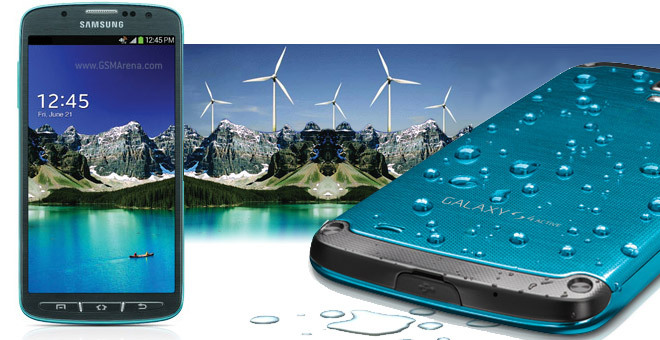 The Samsung Galaxy S4 Active is a the water resistant version of the regular S4 and just like it has a Snapdragon 600 chipset with the four Krait 300 cores clocked at 1.9GHz and a 2,600mAh battery. But the two differ on one key factor for the battery test – the screen. AMOLED and LCDs both have their strengths and weaknesses, so let’s see which one does better when you draw the line. Call time should be unaffected – after all, the screen is off. That wasn’t the case, however, as the Galaxy S4 Active lasted an hour and 20 minutes less than the Snapdragon 600-powered S4. We’re not sure how to account for the lost time, but we did notice some software differences, so this may be it. Next up is the web browser – you’d think that the LCD will be more efficient in displaying mostly white pages, but it made next to no difference in the end (a 10 minute improvement is unsubstantial). It’s a very good time nonetheless and the difference is easily explained with the higher brightness of the Galaxy S4 Active screen compared to the regular Galaxy S4. The video playback time was quite different, as can be expected. 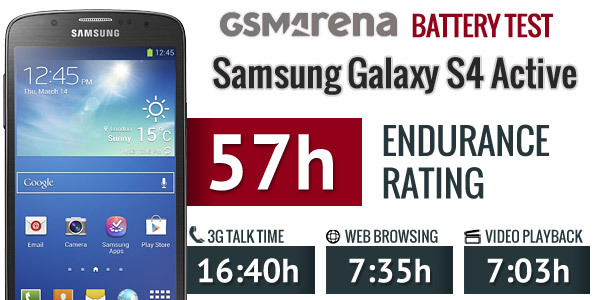 The Super AMOLED can save energy in darker scenes, but the Galaxy S4 Active only managed 7 hours. Again, keep in mind that the LCD is brighter than the Super AMOLED, which also ate into the battery (but might be more favorable to the viewing experience in certain cases). The standby power draw of the Samsung Galaxy S4 Active was essentially the same as its non-rugged sibling, but the lower talk and video playback times brought the endurance rating by half a day. The endurance rating shows how often you can go on a single charge if each day you make calls for an hour, browse the web for an hour and then watch an hour long video. We expected the Galaxy S4 Active to take a hit in battery life, but not quite as much (the talk time in particular was unexpected). This is a rugged phone, which you will presumably take outdoors (away from wall plugs), so battery life is important. On the other hand, you won’t be doing much web browsing in the forest. As far as city life is concerned, the Galaxy S4 Active still offers very good battery life and its user removable battery lets you carry a spare for those occasions when you go for several days without access to a power outlet.